Many beautiful tourist spots are available in Banten Province. If you look for a stunning island, there is Merak Besar Island. It is located near to Merak Kecil Island and Merak Port. The distance is closer to the port than from Merak Kecil, though. The size of the island is 20 ha and it is considered an uninhabited island. The natural beauty becomes the main attraction on the island. Today, it becomes a recommended tourist spot in Banten and it is the home of Krakatau Mountain Tsunami memorial site. Once you get in Merak Besar Island, you can see different types of plants and trees. It is a little bit difficult to explore most parts of the island, though. However, it becomes a new adventure for you. The best feature of the island is the beach. It is the home of coral reefs and stunning sea scenery. Some parts of the coastal area become a great spot for sightseeing, as well. If you come at the right time, you are able to enjoy the comfortable wind and mesmerizing views of the sea! There is the chance to enjoy the sunset, too! Why is the name? Merak means “a peacock”. However, there is no such animal in the island. The name derives from the region of the island. It is also because the island is situated near to Merak Port. From the island, you can witness numerous ferries and local fishermen’s boats passing by. There is beautiful scenery, which is Merak Kecil Island. 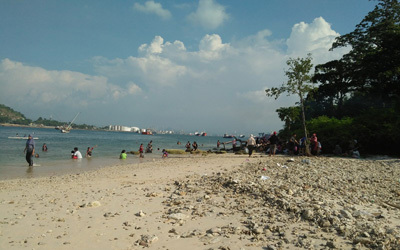 It is situated near to Merak Besar, so tourists can do island hopping easily. Both of the islands share similar characteristics, as well. What can tourists do in Merak Besar Island, actually? The island is the home of a protected forest. Thus, it provides natural and wild attractions to the guests. Like its neighboring island, Merak Besar protects the port from big tidal waves. On top of that, the island becomes a destination for numerous tourist activities such as sightseeing and photography. There are also the coral reefs. These are the reminiscences of the great disaster back then (the eruption of Krakatau Mountain in 1883). As for the tips, you should have prepared some snacks prior to visiting Merak Besar Island. Why is that? There are no facilities and food vendors in this area. In fact, there is no toilet. Another important tip is the communication. You need to ask the number of local boat services. This way, you can call them anytime. Don’t forget to carry some money, though. You are going to use it to pay their service. During holidays, the price can be quite more comfortable. The distance is 127 km from Jakarta to Merak. That means you need to spend about 3 hours. For a faster route, there is Pantura Street. Next, you need to turn to Tangerang-Merak Freeway. Your primary destination is definitely Merak Port. From there, take a local boat to reach the island. It is as simple as that.